1989 Comes to America for the purpose of studying esthetics. 1992 - Graduates from Los Angeles Yamano Beauty College. 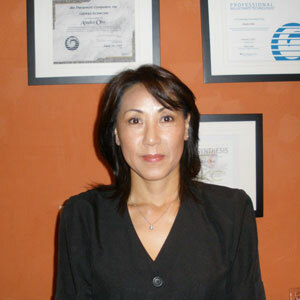 - Certified as a licensed esthetician by the California Department of Consumer Affairs. - Starts her career in the U.S. at a Japanese-American salon in Los Angeles. 1995 Starts independent private room practice from the Scandinavian Skin Care Institute in Beverly Hills (see press release in the "Beverly Hills Courier"). Neighboring private room occupied by renowned eyebrow expert Anastasia. - Moves into neighboring room after the opening of “Anastasia” two years later. 1999 - Moves to a private room in the newly-opened “Sublime,” an art deco-style salon that is introduced on television, and a mere two-minute walk from Beverly Hills’ Rodeo Drive. - Sublime changes owners and becomes “Lush Beverly Hills” (see press release in "Front Desk"). 2007 Lush Beverly Hills celebrity hairstylist Kevin Josephson buys Lush, which becomes the “Kevin Josephson Salon.” To coincide with the takeover, Atsuko realizes her long-cherished and extensively-researched dream of manufacturing her own cosmetics line, “Atsuko Beverly Hills.” She launches her Recovery Serum and Lifting Cream at the Kevin Josephson Salon. 2008 Magazine articles regarding the cutting-edge technology of the treatments appear in both “Genlux” and “944” (see press release). 2009 The superior quality of ATSUKO BEVERLY HILLS has achieved recognition and its products are carried at the Four Seasons Resort Hualalai in Hawaii.